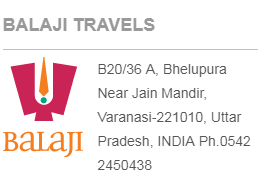 Balaji Travels Varanasi-review. - Reviews and Responses. Home › reviews › Balaji Travels Varanasi-review. This is my honest and first-hand review of Balaji Travels, Varanasi. Several months before, when I contemplated about taking a lengthy pilgrimage to Kasi, Gaya, Triveni Sangaman in Allahabad, Chithrakootam, Ayodhya, and Naimisaranyam, I asked Google to suggest me a few good tour organizer. Out of the several suggestions, I sent email to two companies only. Though both the companies responded, Balaji Travels was the first the to call me. One Mr.Sunil called me within a few minutes and asked me to choose the suitable package mentioned on the company's website. I said, I want a bit of customization on one of his tour package and informed him about my preferences. With in a day, he sent me a revised and customized tour itinerary which was perfect. I was happy that he could understand my requirements and made a customized package. The package cost was very reasonable which included 8 nights stay in the best hotels available at all the places plus an air-conditioned Swift Dezire car driven by the best driver in his company. All the hotels except the one in Ayodhya provided free breakfast. The driver was Mr.Prem who was too good. He was an expert driver, knew all the routes thoroughly. He never stopped the car to ask for the way. In addition, he was a silent driver which suited my preference. The Balaji Travels continuously followed up my tour inquiring about my well being and satisfaction. All the hotels they arranged were very good except the one at Chithrakootam which the driver informed me as the best in that small town. The communication with the Balaji Travels was always smooth, handled by Mr.Sunil whom I believe is the most customer friendly than for his employer. A very rare quality. Others that talked to me from the company were Mr.Neeraj and Mr.Purushotham. My Kasi and Gaya tour began on 1st September and ended on 8th September. I was literally living in the car ever since I was picked up from the Varanasi airport. I mean I spent more time traveling in the car than I spent in the hotel except for the final leg of the tour which I spent happily in Hotel Nest Inn, Lucknow, an excellent hotel that gave great food. If you hire Balaji Travels, I am very sure you will be more than satisfied. You can refer my name and this review.